Amla, also known as Amalaki or the Indian Gooseberry, is a nutrient-rich fruit, whose health benefits has been established and reaped for thousands of years. The countless medicinal properties of this fruit have given it a special place in Ayurveda. That being said, consuming Amla in excessive amounts can cause numerous side-effects. Though the effects may not be harsh, but nonetheless, it can cause a decent amount of discomfort. Amla, in itself, is a good cure for constipation. But in excess it may aggravate the very ailment it is supposed to cure. Consuming Amla in high amounts can cause the stool to harden, thereby causing constipation. The problem is multiplied if water intake gets reduced. Amla is a powerful cardiovascular stimulant. Although it may not pose any hazardous health risks per se, but people with heart problems need to consult their doctors before consuming this fruit. This fruit is rich in Vitamin C. In small amounts it helps in the detoxification of the stomach, in large amounts it can cause acidity. That can trigger other problems like a burning sensation while urinating, foul smell of urine and dehydration. People who are on anti-diabetic, anti-hypertension and heart-related medications should consult with their doctors before consuming Amla. Those who are on anti-coagulant drugs are also advised to stay away from this fruit. Amla is excellent in keeping blood sugar levels in control, due to the sugar level lowering property of this fruit. But if you are Hypoglycemic this could affect in an adverse manner. Indian Gooseberry might increase the risk of bleeding or bruise in some people, especially during or after any surgery. Stop taking Amla at least 2 weeks before a scheduled surgery. Amla is a natural coolant. Therefore, some people with cough and cold may observe that the symptoms are worsening, if they are eating Amla or taking Amla powder alone, or eating Amla in excess amounts. The Indian Gooseberry can be enjoyed during pregnancy and by infants (30-35mg is recommended for the latter). But if it is consumed in larger amounts, it can trigger diarrhea, dehydration, stomach pain and vomiting. Due to Amla’s diuretic properties, consumption of the same in large amounts may leave your skin depleted of moisture if not replenished regularly. It may also cause scalp dryness, resulting in itchy scalp, dandruff and hair loss. 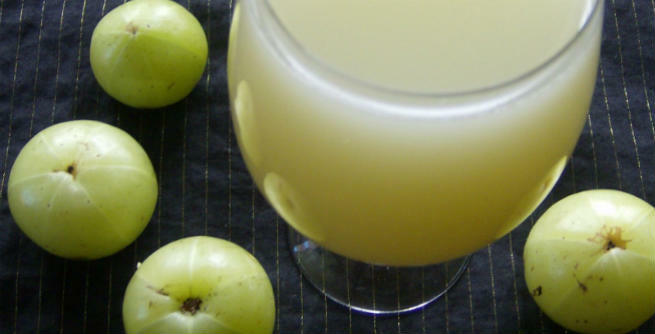 So, drink at least 2 liters of water and consume Amla in moderation to reap the dermatological benefits of Amla. The aforementioned diuretic properties of Amla may trigger excessive loss of water from the body if the fruit is excessively consumed. This will cause dehydration and sometimes cause a sudden loss of weight. Diarrhea, abdominal pain, cramps in the tummy, nausea, vomiting, redness and swelling around your mouth, itching and redness on the face, hives on the skin and face, obstructed breathing, headaches, dizziness, and lightheadedness.